Note: This tank is in the clearance section and the price reduced by $40.00 as the paint color (Red) normally is supposed to also match our red plastic rear fender and front fender for the same model. However, the color was mistakenly done a bit darker so doesn’t match as well. Other than that, its the same as described below. 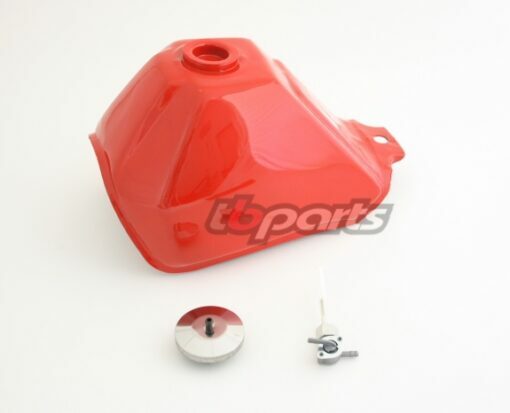 Aftermarket Gas Tank – This is a reproduction gas tank for the 88-99 Z50R. The quality of the tank is very good and they look real nice, however the paint quality is not that of a Honda tank and slight imperfections are possible. They are a very nice alternative to the way more expensive discontinued Honda tanks for those who aren’t restoring their Zs. They also come with a gas cap more like the original one (not a locking gas cap like some others include with similar tanks) and a petcock. Also, unlike similar aftermarket tanks on the market, we have our front mounts welded in the correct location so the tank is positioned correctly.